Sometimes you just gotta break out of juvie to rescue a friend and save the world. Book 2 of the Twelve-Fingered Boy Trilogy finds the two boy heroes—Jack and Shreve—trapped and confined. Branded a “candy” dealer for doling out drugs, Shreve is incarcerated in a juvenile detention center at first, but after he frightens a nurse there, he’s sent to a mental hospital, where he’s drugged for schizophrenia. What his keepers don’t know is that he’s not schizophrenic at all. 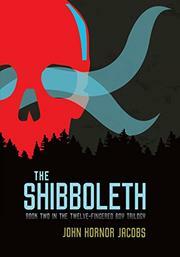 Instead, he’s a shibboleth, a being that can read minds and possess the bodies of others. Readers, on the other hand, know that he needs to escape (there are lots of escapes in this sequel) the center and find his BFF Jack, who’s stuck with a guy named Quincrux, who could be the most evil shibboleth out there. Jacobs’ sequel reads as a series of elongated plot twists that need to move his lead character from one place to the next, usually some kind of prison: Entrapment is key. Shreve’s inner dialogue and snappy one-liners ring both true and trenchant: “In and down I go, into Schneider’s brainmeat, into his unconscious, like some psychic cliff diver in a Speedo.” There is plenty more like this, and it’ll no doubt be the main motivation for readers of this decent sequel.